The postgresql-performance is well looked after by an excellent Postgres contributor, but it's just a special case of query-performance applied to a specific RDBMS. Given that every single question that is tagged postgres-performance will also be tagged postgres, the only gain in having a separate postgres-performance tag is the ability to have a customized tag wiki. 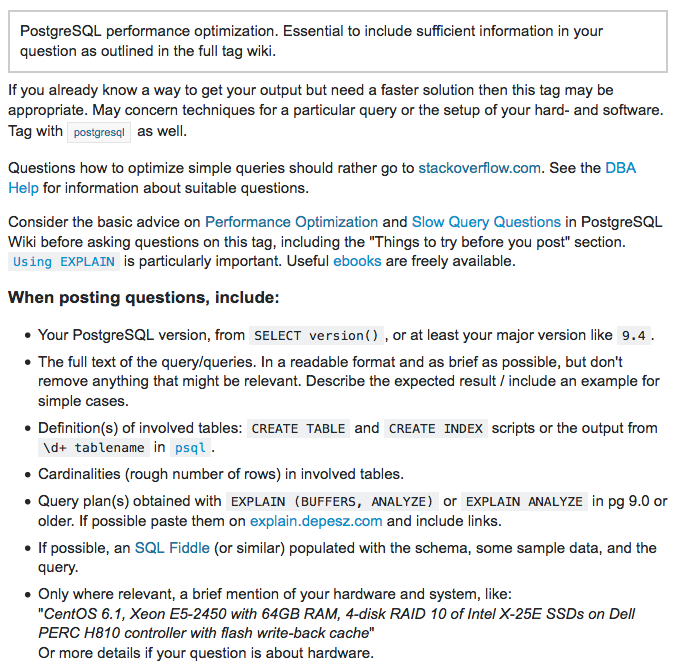 Consider the basic advice on Performance Optimization and Slow Query Questions in PostgreSQL Wiki before asking questions on this tag, including the "Things to try before you post" section. Using EXPLAIN is particularly important. Useful ebooks are freely available. The down-side is that it invites fragmentation of all other tags — do we really want to go down the line of having postgres-database-design, postgres-replication etc? The benefit would be the same for these cases too, namely that we could create tag wikis with Postgres-specific links and information. 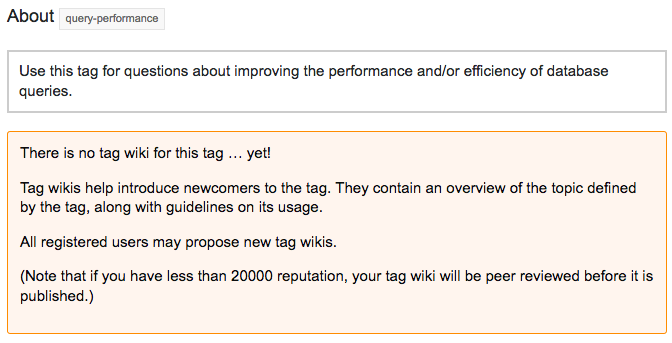 Alternatively, why not just have a single 'performance' tag, and divide the tag wiki into sections for each RDBMS? All the text in the postgres-performance tag wiki could be transferred 'as is' into query-performance et al. How often is the tag wiki page visited. Which tagging system is more beneficial for search purposes. If general performance aspects are involved, it can make sense to additionally or instead tag one or more of performance, query-performance, performance-tuning - which also serve well for RDBMS that don't have a specific this-rdbms-performance (yet). Other than that, I can subscribe to what Paul answered. The tag should stay. This tag therefore adds value to the community in the practical way it is used. We will also need to notify people with the old tag in their subscriptions and filters to change these to postgres plus query-performance (where that is even possible). This makes work for the subject area experts, without providing them with any compensating benefit. It will also deprive them of a tool they explicitly created and actively use & maintain. Why bother with this change? The current tag appears useful to the people using it, and is not causing any actual harm to the site. Making the change may inconvenience existing tag users, and require moderator time to implement. The only benefit seems to be to eliminate a perceived technical redundancy in the tagging system. It does not set a precedent. New tags are reviewed on their merits. Not the answer you're looking for? Browse other questions tagged discussion tagging retag-request . Shall we add a new 'off-topic' reason for questions that really need professional support? A convention for RDBMs specific options?